During their lifetime few artists attain the international acclaim which has been accorded to André Hambourg, the distinguished laureate of French contemporary art. 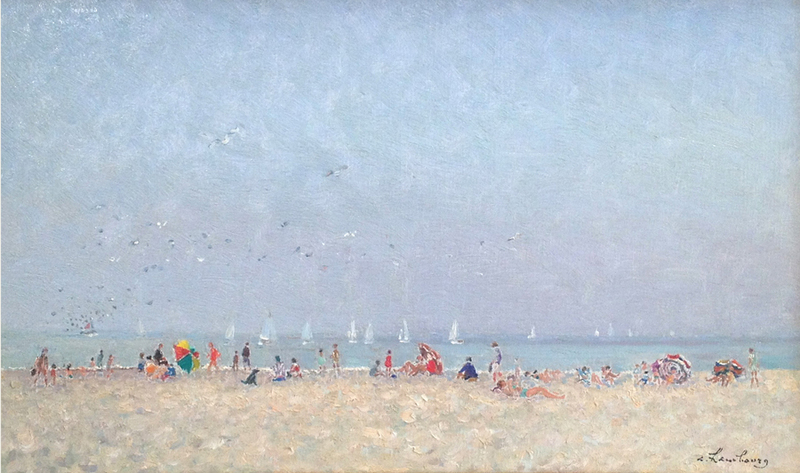 His paintings hang in more than fifty museum in France and other countries, and private collectors from all parts of the world have acquired his luminous marines and beach scenes, his poetic compositions of Venice, his landscapes and still lifes – works which brilliantly transcend the art of Impressionism. His name and paintings are synonymous with the highest standards of French art. André Hambourg is that rare creative talent, a complete artist. Apart from his oils, pastels, watercolors and drawings, he has developed an enviable reputation in the fields of lithography, engravings, ceramics, mural decorations and illustrations for deluxe editions of books by such important authors as Saint-Exupéry, George Duhamel, Sully Prudhomme, Henri de Regnier, Henry de Montherlant, Joseph Kessel and many others. 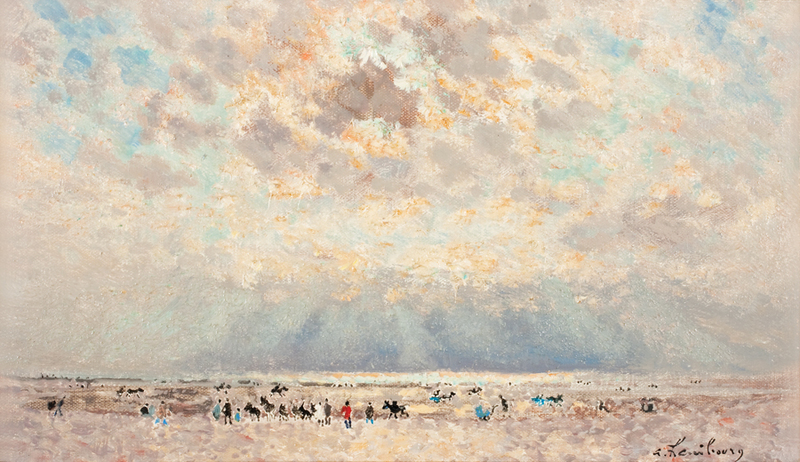 Year after year, his one-man shows in Paris, Honfleur, Cagnes-sur-Mer, Brussels, London, North Africa and in the Wally Findlay Galleries in New York, Chicago, Palm Beach and Beverly Hills, have added to both his fame and stature in the art world. 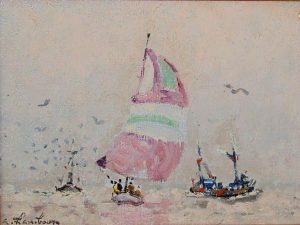 André Hambourg was born in Paris in 1909. He began his career in the arts at the Ecole Nationale Supérieure des Arts Décoratifs where he studied sculpture in the studio of Niclausse. In 1927, he enrolled in the Ecole Nationale des Beaux-Arts as a student of painting with Lucien Simon. Zbrowski, Modigliani and Soutine’s dealer, introduced him to Henri Bénézit, who presented Hamburg’s first important one-man show in Paris in 1928. Hambourg was only nineteen years old at the time. He then became active in the important Paris Salons. With his friends Francis Grüber, Brabo, Launois, Garbell, he participated in the art movement of Montparnasse. Derain, Friesz and Kisling encouraged him. 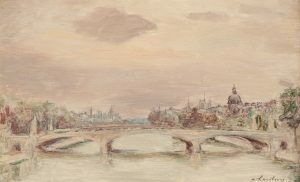 In 1930, he had his second one-man show in Paris, and in 1931 his increasing prominence was indicated by his being made a member of the Committee of the Salon de l’Art Français Indépendant and the Salon de l’Oeuvre Unique. 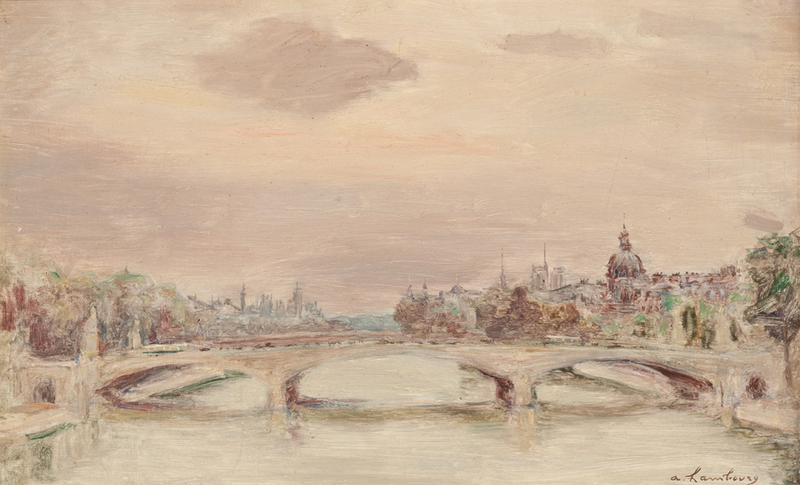 His third one-man show in Paris in 1932 could be termed the final phase of his early work. 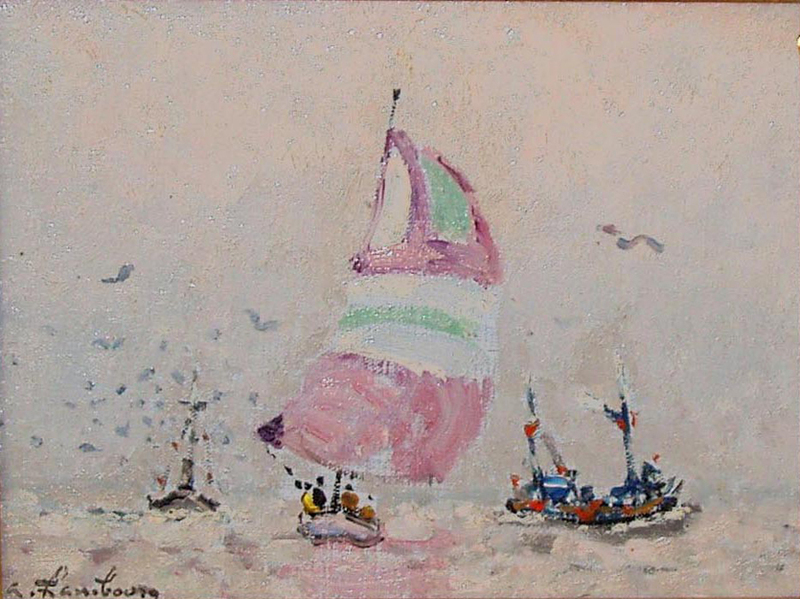 One thinks of André Hambourg as a sensitive interpreter of the Normandy coastline or of Venetian canals, but to achieve this distinction his life and work have passed through many formative stages. In 1933, André Hambourg received the first honor of his developing career. He was awarded the Prix de la Villa Abd-el-Tif and, as a result, he went to North Africa for the first time. There he became aware of the importance and power of light, that myriad brightness, that intangible luminous quality through which strange shapes merge into a haze. Against this shock of brilliant sunlight, he found that poverty stood out in all its bleakness, and this he recorded on canvas. 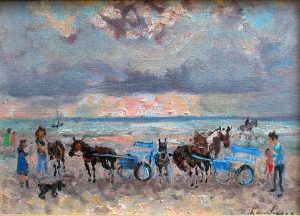 From 1933 to 1935, he painted in the southern region of Algeria and had one-man shows in Paris, Algeria and Oran. In 1946, André Hambourg resumed his painting career. 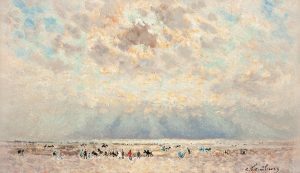 From that year on his unremitting work and a succession of exhibitions in France and in other countries demonstrated his ever-increasing, absolute search for movement and light. He had spent many years until then working in monotones and mutations of light. 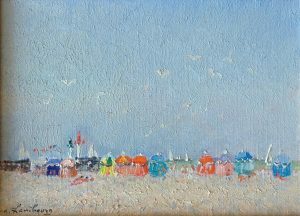 Now, however, he began moving towards a perception of color by means of pastel, and in 1957, he made his first trip to Venice where the transition reached its completion. A year later an exhibition of his paintings of Venice was held in Paris. 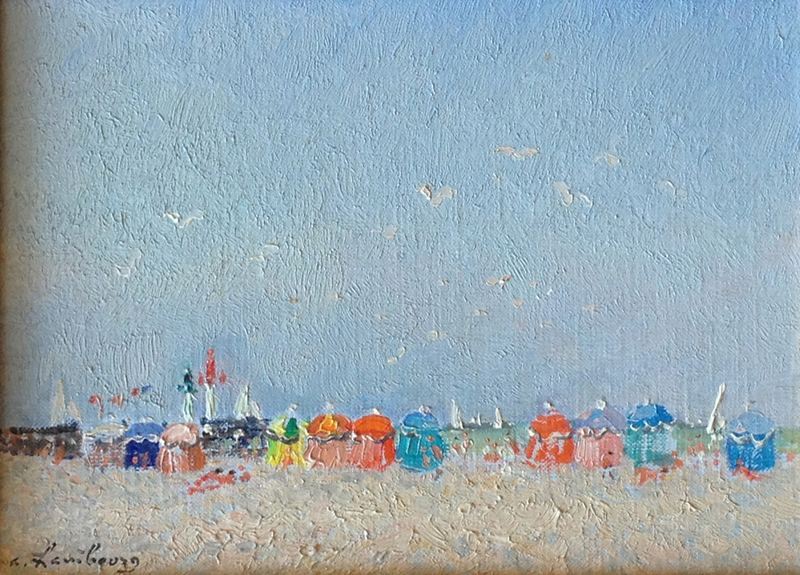 The movement, the color and the vibrancy of Venice came to life in these works. 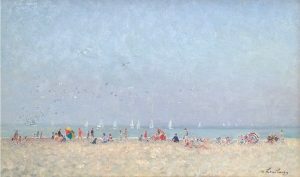 To appreciate Hambourg’s art one must understand its development and its transitions from the youthful dark canvass, the scenes of conflict and the sudden perception of light, to landscapes in which the mind can rest in beauty, in fantasies freed from constraint. In all his wide-ranging travels, Hambourg carries his own artistic ambience with him. Venice, Paris, Honfleur and even London have the same spiritual and artistic climate for Hambourg. Color assumes the same importance and proportion, and the muted light, so unlike that of North Africa or the Mediterranean, accentuates its impact and detail. With this change of emphasis his scenes differ from his earlier paintings, not in sensitivity, but rather in perception and aim. It is the transient, the immense universal mutability of world and sky to which he unceasingly returns.